The hellefisk knife from helle comes with an impressive 4.8" Sandvik 12C27 stainless steel blade. This is an extremely tough and highly durable metal, making it ideal for a knife. The Hellefisk can slice, cut and pierce materials since the edge has been sharpened to a razor point. The handle is made from a cork material and measure in it 5.2". This gives it a traditional look and is very comfortable to hold allowing you to use it for prolonged periods of time. 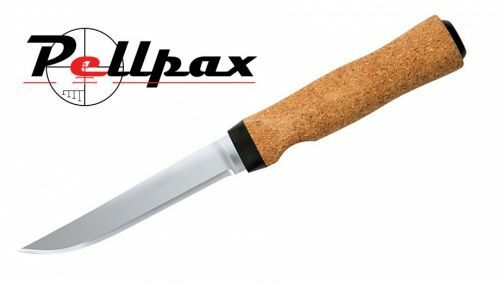 The groove at the front of the handle allows you to get a natural hold on your knife and prevents your finger and the blade coming into contact. The Hellefisk comes with a leather sheath providing an easy yet efficient way to transport your knife. It also stops the blade cutting any material when not in use.